MONTEBELLO, Calif. — Wendy Wan, 31, said American infant formula is advertised in her native China as the most nutritious food for a newborn. “It sounds like it’s premium,” said Wan, who gave birth in early May at Beverly Hospital here. Wan said she was skeptical of the ads and had planned to feed her baby son only breast milk. But when her milk failed to come in quickly, she didn’t hesitate to supplement it with formula. “I prefer breastfeeding, but I think it’s almost the same,” she said from her hospital bed the day after her son was born. It’s not the same. The American Academy of Pediatrics recommends exclusive breastfeeding for the first six months of a baby’s life because of the well-known health benefits for both infants and mothers. Women, like Wan, who start with the intention of feeding their babies exclusively breast milk but then supplement it with formula while still in the hospital are nearly three times more likely to stop breastfeeding within two months, according to one study. California has made significant progress in recent years promoting exclusive breastfeeding in hospitals, but many women aren’t sticking with it. All but a small fraction of women start breastfeeding while in the hospital, but nearly one-third introduce their babies to formula before leaving, according to data from the California Department of Public Health. Wide gaps also separate California’s counties and hospitals. Some facilities reported exclusive breastfeeding rates of more than 90 percent and others less than 25 percent. Some of the hospitals with the lowest rates are in lower-income communities. The statewide average is 69 percent. In an effort to diminish the disparities and improve the health of babies, state law requires hospitals to implement concrete measures to promote breastfeeding no later than 2025. Research shows that breastfeeding babies can reduce their risk of obesity, diabetes and asthma. It can also lessen the chance of heart disease and cancer in mothers. Nationally, non-Hispanic black babies are significantly less likely to breastfeed than non-Hispanic whites or Hispanics, according to the Centers for Disease Control and Prevention. Mississippi, West Virginia, Louisiana and Arkansas have the lowest breastfeeding rates in the U.S. Colorado, Oregon, Idaho and Washington have the highest. About 60 percent of women in the U.S. stop breastfeeding before they had initially intended to, the CDC said. Among the reasons: worries about their infants’ weight, problems with latching, unsupportive policies at work and lack of education about the benefits of breastfeeding. Another factor may be the unintended consequences of patient satisfaction scores, said Carmen Rezak, maternal-child health quality coordinator for AHMC Healthcare, a Southern California hospital chain. Because patient ratings are tied to hospital reimbursement, nurses are sometimes afraid to deny patients’ wishes. They may not want to tell relatives they cannot visit, for example, even if more privacy and quiet time encourage breastfeeding, Rezak said. The publication of statewide data on exclusive breastfeeding rates places “pressure on hospitals” to really look at their policies and practices compared with their competitors, said Jen Goldbronn of the state’s public health department. One of the best known ways to increase rates of exclusive breastfeeding is by following the “Ten Steps to Successful Breastfeeding.” These include helping mothers start nursing within one hour of birth, not giving formula to babies unless medically necessary and informing all pregnant women about the benefits of breastfeeding. The organization Baby-Friendly USA requires hospitals seeking its “baby-friendly” seal to follow the 10 steps. In California, nearly 100 hospitals have that designation, up from 12 in 2006. The state law requiring hospitals to have breastfeeding support measures in place by 2025 specifically names the 10 steps, but also allows hospitals to adopt alternative practices proven to encourage breastfeeding. Trish MacEnroe, executive director of Baby-Friendly USA, said hospitals across the country used to discourage breastfeeding inadvertently by whisking babies away to nurseries. Now, newborns typically stay in the room with the mother and start nursing immediately after birth. Urging moms to hold their babies “skin to skin” right after birth helps encourage breastfeeding because of the physical proximity, according to research. Some of the hospitals with the lowest rates of exclusive breastfeeding in the state are Whittier Hospital, at 20 percent, and Monterey Park Hospital, at 22 percent. The two hospitals, both run by AHMC Healthcare, serve a high number of Asian moms and others who come to the country for the sole purpose of giving birth, Rezak said. Foreign parents are among the most difficult to convince about the importance of exclusive breastfeeding, in part because of cultural barriers or myths about the value of formula, she said. Education is also important, Rezak said. Hospital staff try to teach all new moms to recognize when their infants are hungry or tired. At PIH Health Hospital Whittier, moms who want formula have to sign a form acknowledging they understand their decision, said Valerie Martin, clinical director of maternity care. The hospital’s rate of exclusive breastfeeding is 80 percent, compared with 33 percent at its sister hospital in Downey. 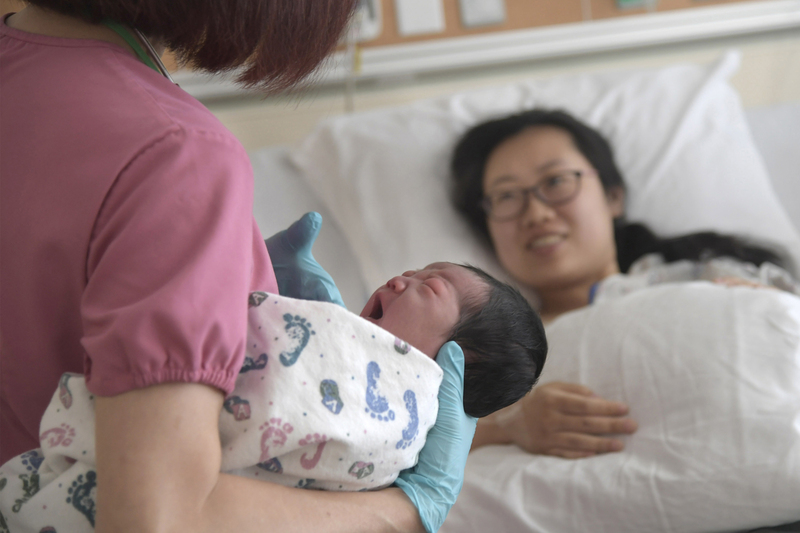 At Beverly Hospital, where Wan gave birth, nurses show patients different positions for breastfeeding and reinforce the importance of exclusive breastfeeding. But they also try not to push new mothers, said Melissa Morita, director of maternal and child health.